playjunior wrote: Bob, a big difference between 1995 and now is that now you can encrypt, zip and email the source to yourself and it will take you 3 minutes. It is that simple. I read long time ago when Strelka came out someone asked Vasik whether it might be possible that his code got stolen, he said no, because he keeps it a dedicated computer with no internet connection. A person who takes such precautions would surely take a minute or two to take care he has a backup copy. Osipov Jury wrote: Is it also plagiarism? You didn't post complete code. The real code is identical except for the or-ing in of the X-Ray attacker, right? Something that you can find in crafty, Stockfish, or any other open source bitboard program. But, what to say of the comparison against the (arbitrary) constant -60? Where does it come from and why do both programs have exactly the same? Laskos wrote: Wow, your graphs are almost identical to mine, therefore we can cross-check our results. I will stick to "Average Linkage between Groups" and "Pearson correlation (bivariate correlations) measure", as these give me the more stable results over all the range, from main branches to individual engines. I added Crafty 20.14 and some claimed to be related to it engines, and, as expected, they seem indeed related . Now the Crafty family is represented as well. My Crafty test was a pain, with a very slow WB2UCI interface, it took me 5 hours to test Crafty at 100 ms.
A and B are two groups of very unrelated engines. Group A might be related in some degree to Fruit. 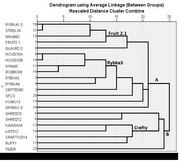 Group B seems not related at all to Fruit (if the Fruit hypothesis stands). Crafty, Fruit 2.1, and Rybka 3 families are named. With some WB engines, the test is much quicker. I need to test Kaissa 1.8 and some more Craftys. You are very strong teacher. I would not want to be your student. I would not call not considering X-rays in SEE a bug but a design descision. SEE swap algorithm is more in the public domain with some freedom to implement things differently, which had happened here. Even one may formulate the two's complement aka -mask per definition as ~(mask - 1) or ~mask + 1. No idea on the -60 though. I also see no plagiarism in formulating a dot-product for mobility by a bitboard serialization loop, multiplication with popcounts, or a SSE2 dot product. If weight constants are identical this is more questionable, not as lonesome feature but in conjunction with multiple other symptoms of similarity. I do not know about your email but I can check emails in every computer and I only need my username and my passward. In other words the content of my emails are saved in a different place than my computer. Send it to a friend or a family member. I don't use free email machines. Non-secure and I have too many discussions about student grades and such. My email is on my office box for the same security reasons. The US FERPA (Family Educational Right to Privacy Act) is pretty onerous and requires reasonable protection for student discussions. gmail, yahoo, etc do not provide that. Which would mean "quantity over quality?" I have my sources backed up on three different machines, plus the occasional DVD dump in my office for a semi-permanent backup, multiple copies over time... I don't know who backs up their email. Most don't in fact, and leave it on the remote server which will probably dump it after a while. bob wrote: I don't use free email machines. Non-secure and I have too many discussions about student grades and such. My email is on my office box for the same security reasons. The US FERPA (Family Educational Right to Privacy Act) is pretty onerous and requires reasonable protection for student discussions. gmail, yahoo, etc do not provide that. OMG. I hope you've heard of IMAP???? playjunior wrote: Send it to a friend or a family member. Which would mean "quantity over quality?" Basic statistics. Say probability for each of your friends to lose your emails is 10% and probability that one of your reliable storage fails is 0.1%. Overall it's 0.1^10 = 1e-10 vs. 0.001^3=1e-9 .